Quick walks, hot weather, small purse, always on the go, running out of the house- that’s what it is all about. 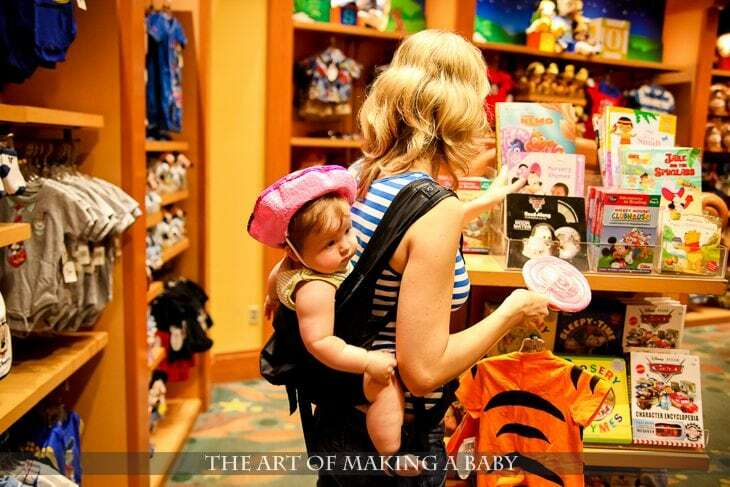 During our trip to Disney, we had a chance to try out the new lightweight Boba carrier, BobaAir. It really couldn’t have come at a better time because we had determined that we wanted to have both a stroller and a carrier with us. The issue was, of course, having to lug the somewhat bulky traditional carrier around, as well as the heat of Florida. The two carriers we had were both way too structured, thick and hot. So the release of Boba Air could not have come at a better time. It’s perfect for travel. It’s perfect for toddlers. It’s meant for quick trips to the grocery store. It’s great for being kept in the glovebox of the car for the “emergency baby wearing situations”. For a carrier, it’s very cool ( temperature-wise). 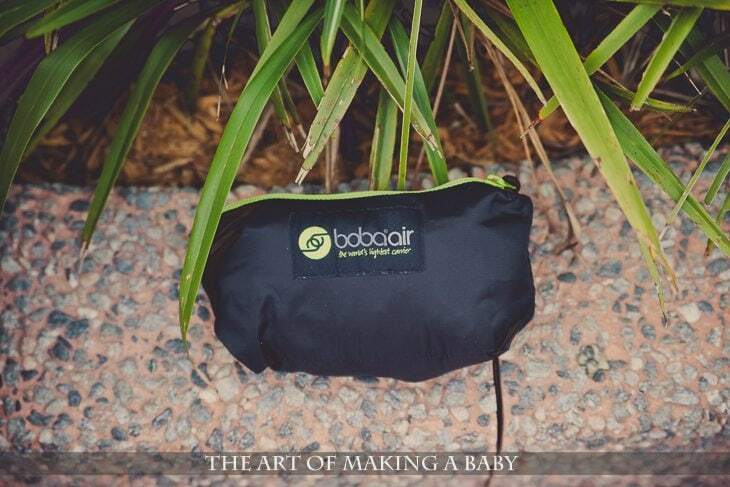 It’s made out of nylon, so it’s not exactly “breathable” in the traditional sense of the word, but compared to the fabric wraps I’ve used and structured carriers it allows the most air flow and the least amount of heat on your and your baby‘s skin. 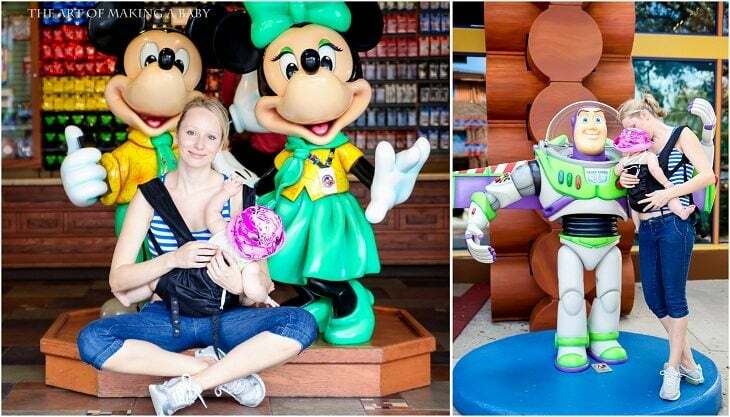 During our hot hot Disney trip, never once did I feel the need to “get the sweaty baby away” from me. Considering we had a stroller AND a carrier at Disney, this was a perfect one not to get in the way. We used a stroller by day to protect the little one from the sun and in the evening when Lexi was getting tired and needed the comfort and closeness of her mama, BAM, comes out the lightweight Air. Standing in lines to the attractions – Boba Air, waiting for the bus- Boba Air, getting to the park – Boba Air. 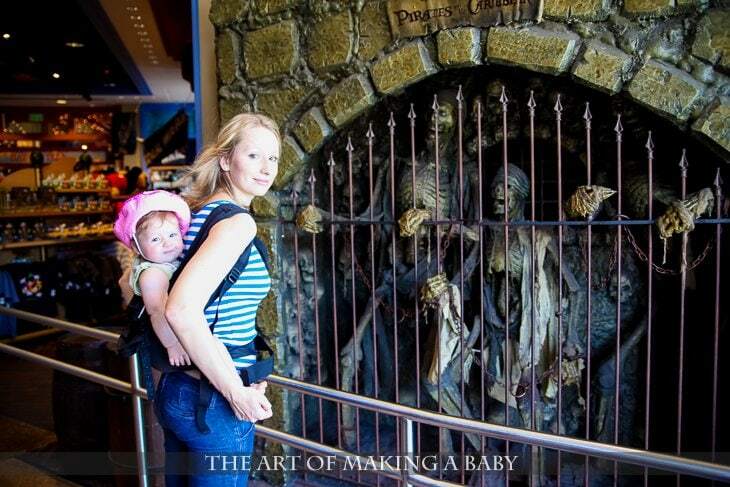 Having to do it all with the stroller alone or with a bulkier carrier would not have been as pretty. PRICE: $65 (say what?) Yes! Very affordable! Even non-babywearers should consider the carrier at this price and features. Sleeping hood and leg straps are included, carrying pocket is attached. Too bad Lexi has not slept in a carrier since she was 1 month old- would have been nice. The carrier fits anyone from 5’0 to 6’3, any size. You can carry a child from 15lb and up to 45 pounds. It can be used in a front and a back carry. 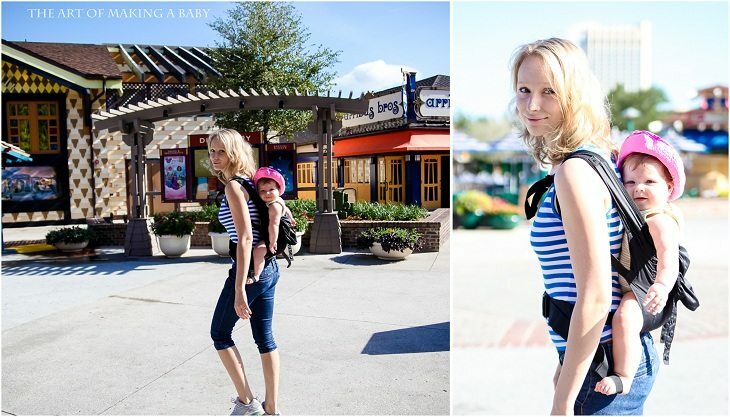 In fact, Boba Air was the first carrier we successfully tried the back carry with and you can see Lexi loved it. I keep my Boba Air in the glovebox or the trunk of the car so that I always have a carrier handy even when I rush out of the house without grabbing one. I use the Air for grocery shopping, Disney was awesome with it, any travel, any situation where I might need to get Lexi in and out of the carrier more than once, any unexpected situations, because it’s always handy. If you find yourself wishing for a lighter, more portable, cooler carrier to compliment the one you already own, this is PERFECT! 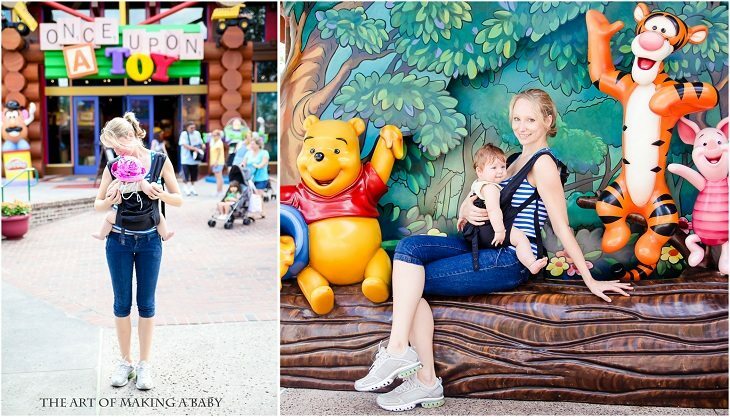 If you’re new to the babywearing business, buying both a Nordic I reviewed here and a Boba Air will cost you almost as much as buying one Ergo would and will give you a lot more opportunities for comfortable and convenient baby wearing. You really can’t lose on that one. Disclosure: No payment or compensation, other than the product sample to facilitate the review, was received for this post. All opinions are my own and 100% honest, as always. It looks like you all had a lot of fun at Disney! For what it’s worth, there are a LOT of carriers out there for less than $65 – all of the ones from Infantino, for example. If you’re looking for a cheap, lightweight carrier, I’d start there. I’ve got an inexpensive (about $30) mei tei that I LOVE and it’s lightweight and easy to bundle up and stuff in a diaper bag. And in terms of sun protection, we just use a sunhat on our girl when we’re out all day – no need for a stroller. We recently spent 7 hours at an all day outdoor music festival and I wore my 10 month old in the carrier all day, and we were both super comfortable! And you may want to know that when you say you weren’t compensated, if Boba gave you a carrier to keep, then you were technically compensated from a legal standpoint. The carrier has a monetary value, and “goods” (which the carrier is) are considered compensation, especially since you have you list all of the products to receive to review on your taxes as income (http://www.bloggingbasics101.com/2011/12/what-do-bloggers-need-to-claim-for-taxes/). I’m glad you do the disclaimer on your review posts, but you may just want to remove the sentence “I was not monetarily or otherwise compensated for this post.” since it would not hold up legally. What did you do with legs and arms from the sun protection standpoint? Re: disclosure, I am aware of the tax implications, however the disclosure has nothing to do with taxes and is solely to specify the lack of bias in the review and disclose a relationship. What the disclosure says is that the review was not paid for and hence the opinions are not biased. Receiving a product to try out is a very common thing in media and is not considered compensation from the stand point of the review bias ( which is what the disclosure is for). Some reviewers actually CHARGE to write a review and receive the product to review, which would make the review itself more biased. So the disclosure is to let the readers know that I did not receive compensation to write it, I was simply sent a product. It has nothing to do with taxes, those are solely my business and don’t need disclosures. “What did you do with legs and arms from the sun protection standpoint?” – Sunblock! I like both Badger and California Baby, both have good ratings on the EWG and work really well. We also live much further north than you, and in the fall and winter long sleeves and long pants help as well. I know that most bloggers receive free products to review (except for awesome bloggers like Young House Love, who refuse freebies! I think that is so cool that they don’t accept any swag. ), but in terms of the technical definition of “compensation”, the value of the product itself falls into that category – it’s just the correct usage of the word. In Florida sun I just don’t trust sunblock to protect well enough. We did use sunblock on her anyways, of course, but I felt like we need some extra protection. I think 97% of people would get just what she said. It means this is my opinion they didn’t pay me to say it because so many people do post paid reviews. How did it feel on your shoulders after a few hours? That is what I get worried about with the lack of padding. I was concerned as well, but I swear I didn’t notice anything. If you spread the fabric well enough I think it distributes weight pretty well. One thing I did notice is bigger lines on Lexi’s legs. You know how most structured carriers leave red marks on their little fat legs? Well, I thought Boba Air left more pronounced marks. That could have been just her positioning, though and I need to pay closer attention to her sitting in it properly. I now use it all the time though, as my primary carrier unless we are going on a longer walk. Can I ask how much Lexi weighs? 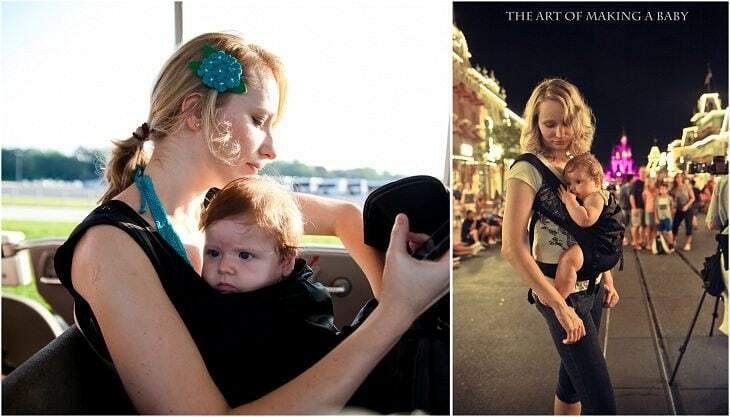 I like the idea of the carrier, but my boys are probably a lot bigger than she is. Last time she was weighed she was 21 or 22 lbs I think. You said she weighed 22 lbs around her 5 months and that she was in the 97th percentile for weight. Hasn’t she gained at all? No she’s been evening out. I think she was 20 or so at 6 months check up, 21 at 7, 22 at 8 or smth like that. That’s pretty close, then. My little one is 26 lbs. Thanks for the review. I love finding new carriers to try out. Is that a large lollipop I spy in your hand? I thought you didn’t eat that kind of stuff? FYI as a super inexpensive, super breathable option, I made two quick-and-dirty Moby-style wraps out of $1 a yard gauzy cotton. I just bought a few yards, then split it vertically. I even did it in the store. My husband and I each had our own wrap to trade our son back and forth through the parks, and for less than $5 apiece. We had identical fleece ones for cold weather too. I love my Moby, but we found it too hot for Florida summers. The fabric is nice and thick so I can’t even imagine sweating in it while walking around parks. Though it would be comfortable that’s for sure. The Moby, Sleepy Wrap, etc. are very hot. The wrap that Matt’s Wife is talking about is with cotton gauze, which is incredibly breathable and lightweight (no stretch, though, so you have to be good at doing a wrap!). I DIYed one of those as well. I’ll have to look into a tutorial and see if I can do it. Is the leg straps really included in the Boba Air?